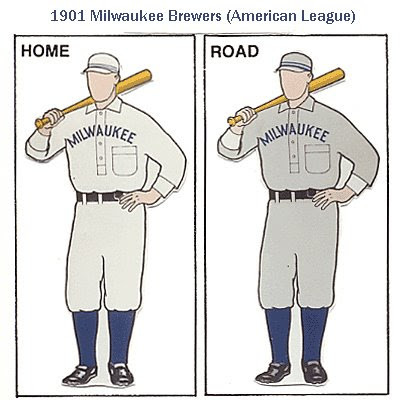 Following up on yesterday's discussion of the Brewers' inaugural season in the American Association, the 1902 Brewers wore uniforms identical to of the 1901 AL Brewers, save for the caps, leading me to believe that they may have purchased them directly from the departing club. 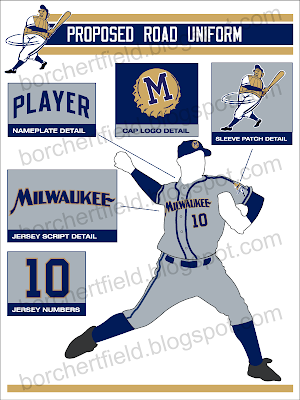 This team is identified in Brian A. Podoll's must-read book The Minor League Milwaukee Brewers, 1859-1952 as the 1903 Brewers, but if the player identifications are correct (and if Baseball-Reference.com can be believed) this is actually the 1904 club. 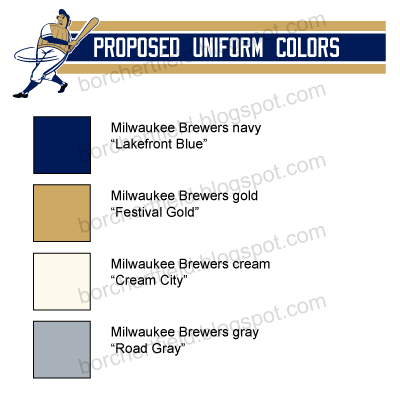 I'm presuming that the collar and script are navy blue, but that's entirely based on the relationship the Brews had with the color. It sure looks darker than royal, but the Brewers didn't have a history of wearing black. I went ahead and bought the domain name, so please update your bookmarks - the new address for this blog is http://www.borchertfield.com/. I presume the old Blogspot address will still work, but you can use the more direct route to get here from now on. I picked up this photo a couple years ago, not entirely sure what team it represented. But heck, I love a good mystery. 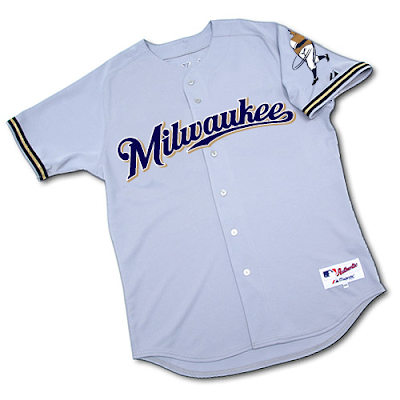 I originally thought it could have been an early American Association Brewer team, one of the Western League clubs, or even the short-lived (1902-1903) Milwaukee Creams. 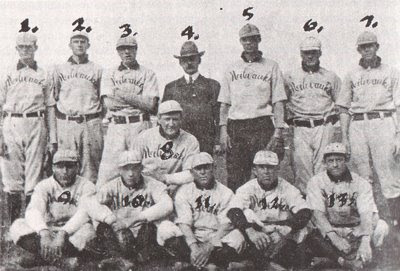 I was right the first time - thanks to Rex Hamann (of the excellent American Association Almanac), we now know it to be the 1902 AA squad. 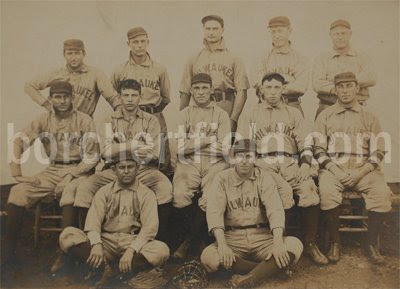 Sepia-toned 6 ½ x 4 ½” photo shows team portrait of the Milwaukee ball club from the outlaw baseball league, the American Association, who were once a legit major league team from 1882 to 1891, but, starting in 1902, the year this photo more than likely radiates from, began operating independently outside of the Major Leagues. Standout left-handed pitchers Nick Altrock, who would go onto the Majors (primarily as a Chicago White Sox and Washington Senator) after his brief stint with Milwaukee, and Eddie Plank, baseball's winningest lefthander pre-Spahn, figure most prominently in photo. Let's do a little side-by-side. Click the comparisons to see original photos. Looking at the photo, the man seated in the second row, second from the left is clearly a young Nick Altrock (seen here 20 years later). 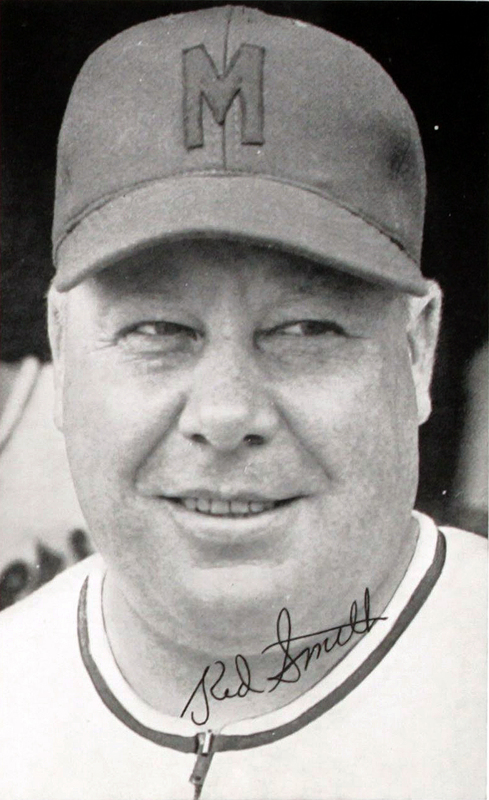 Rex identified "the taller man in the back row" as Claude Elliott. 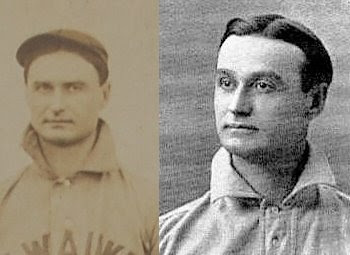 Altrock and Jacobson spent one season in Milwaukee - 1902 (Elliot played two seasons in the Cream City, 1902 and 1903). I'm not sure which player Lelands thinks is Eddie Plank. I guess that could be Plank seated on the ground on the right - he seems to have the chin for it, although his nose and face appear too broad. Maybe they were looking at the man standing to the right of Elliott, who has the narrow face and prominent chin, but again he doesn't fit. Nope, not really seeing it. 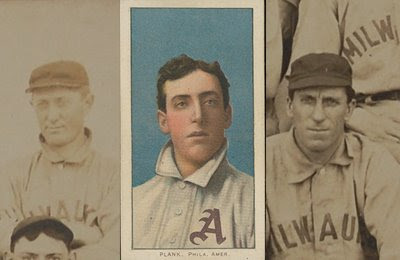 But more damning is the question: did Eddie Plank even play for the Brewers? 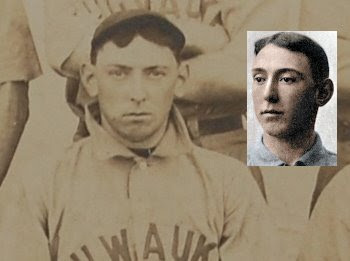 I'm having a hard time digging up his minor league history, but in 1902 he pitched 36 games for Philadelphia (AL) - what would he be doing in Milwaukee? The more likely answer is that Lelands mis-identified the player. Still, we have enough to date the photo. Three confirmed players with limited time playing for the club give us a pretty conclusive date of 1902. And there you have it. 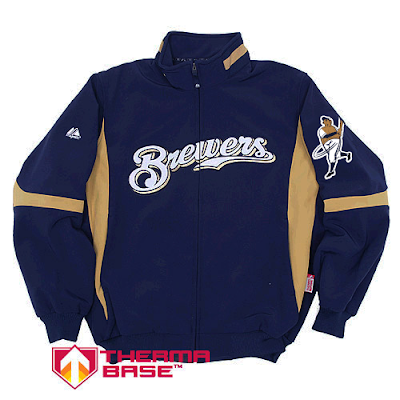 The photo represents the inaugural season of the American Association Milwaukee Brewers. Knowing this, I'm even more thrilled to have it in my collection. Thanks again to Rex Hamann and Paul Tenpenny for all their help. 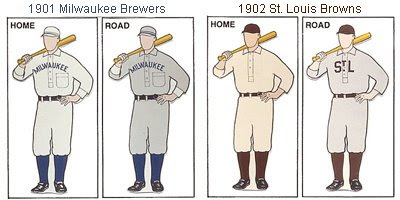 Next mystery - did the 1902 Brewers buy those uniforms from the recently-moved 1901 American League club, who wore the same mark across their chests? 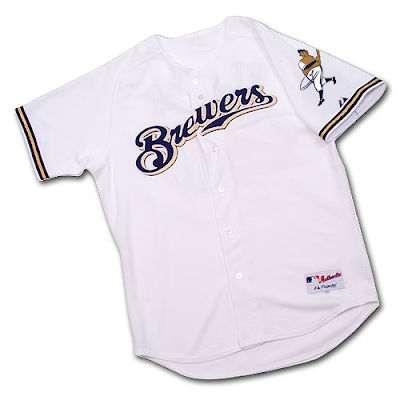 This beautiful Brewers jersey came up for auction in October of 2007 (full disclosure: I bid on it at the time, but didn't win). 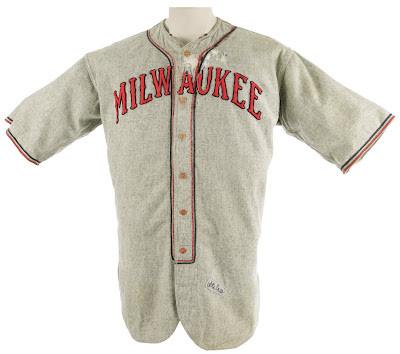 Once again, auctions provide an excellent look at uniforms of the past. 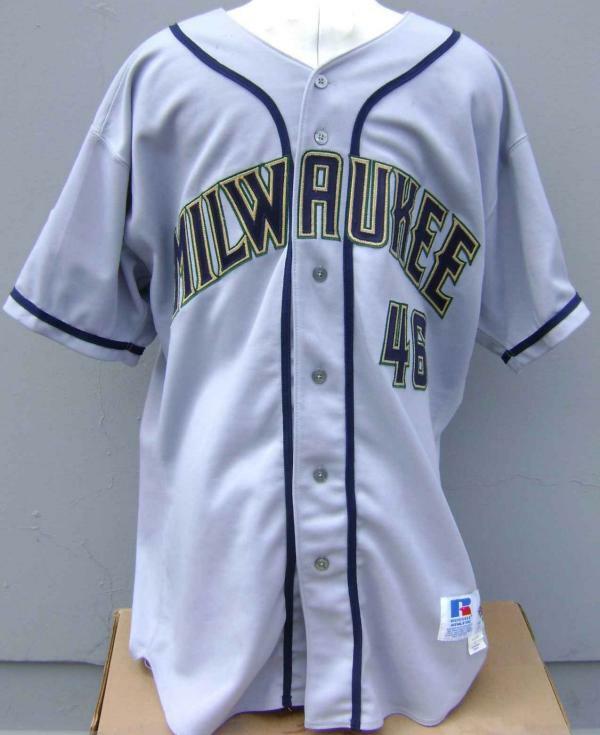 Lot: 19635 - Late 1930's Milwaukee Brewers Game Worn Uniform. Duly proud of its sudsy claim to fame, Milwaukee has utilized the nickname "Brewers" for local ballclubs dating back to the turn of the century. Here we find a full uniform from the American Association farm club of the Cleveland Indians that bore the time-tested title, one of the earliest Brewers representations known. Red and blue felt spells "Milwaukee" in elegant block-lettered text across the chest, with a midnight navy number "2" taking up residence on verso. The jersey is tagged in the collar with "Wilson [size] 36" and local "Burghardt Athletic Goods" labels, as are the matching pants. 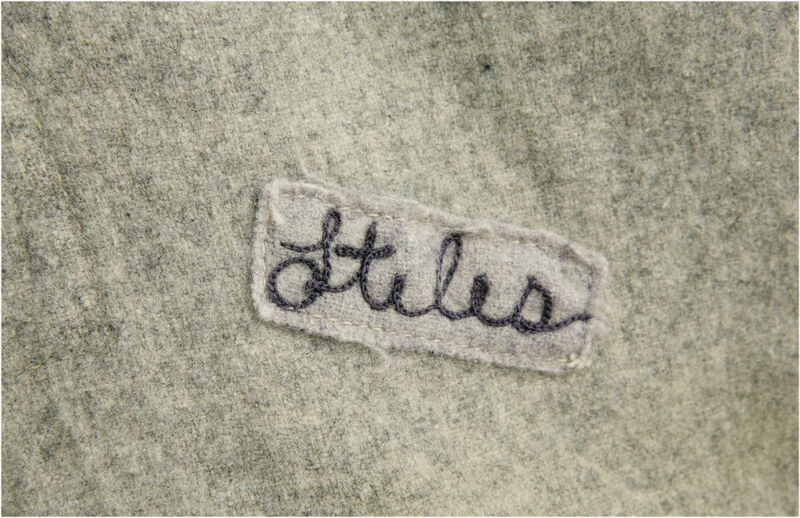 An embroidered swatch affixed to the jersey's tail reads "Stiles," most likely the short-tenured St. Louis Browns pitcher of the early 1930's Rollie Stiles. Pants have similar swatch reading "Fieber" or something similar. 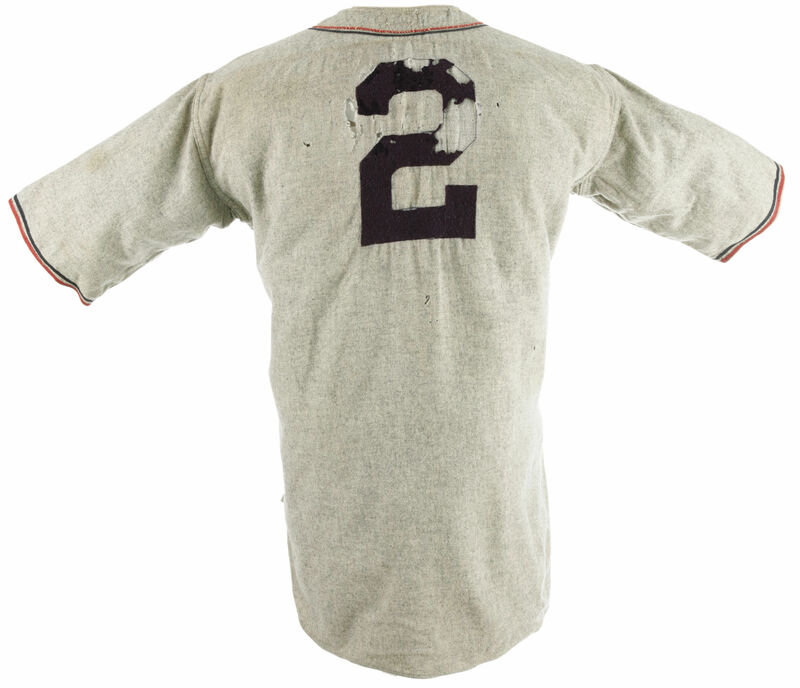 A degree of damage to the jersey's chest and back must be noted, though it still displays quite nicely despite these flaws. When paired with the pants (which remain in fine condition) and the included two pairs of socks (though we believe only the red and navy pair matches), it will make an impressive sight. LOA from Lou Lampson. Lampson's reputation has taken something of a beating in recent years. For what it's worth, I don't think the extra socks belong with this uniform either. The pants are another matter. 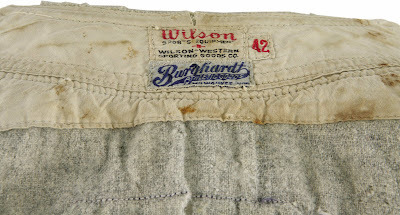 The Burghardt tag (Burghardt is still around, incidentally) indicates that the Brewers may have worn them - I'll explore those in a separate post. I'm wondering why they've dated this "Late 1930s", as based on the player these are certainly from the early 1930s, when the Brewers were not only affiliated with but owned outright by the St. Louis Browns. Stiles spent part of the 1932 and 1934 seasons with Milwaukee, so that fits with the tagging. Also not sure why they bothered to name-drop the Indians, other than there is presumably more interest in their collectibles than those of the Browns. Personally, I really like the æsthetics of this jersey. Love the double-piping. And I'm always impressed when teams, especially minor-league teams, spring for a vertically arched wordmark instead of the cheaper radially arched version. 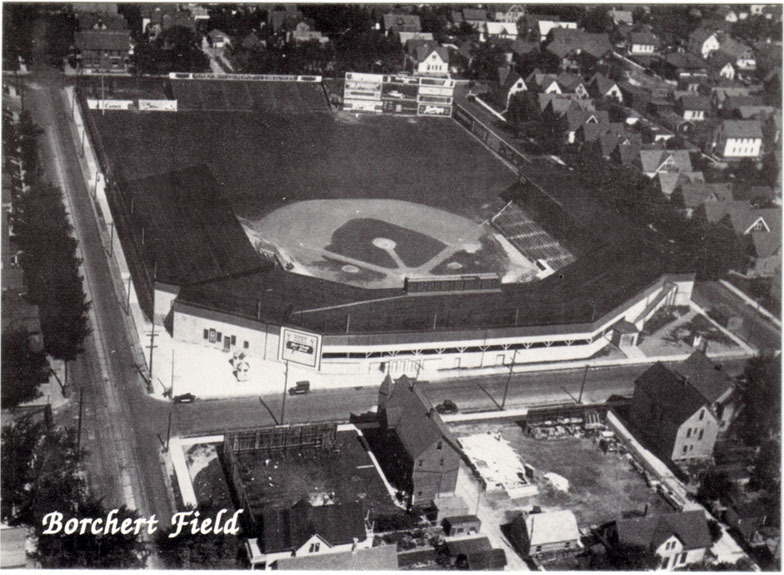 Wedged into a single city block, Borchert Field had a very unusual layout. Looking somewhat like the Polo Grounds in Manhattan, the corners were cut off by Seventh and Eighth Streets, creating short porches to both right and left and long power alleys. 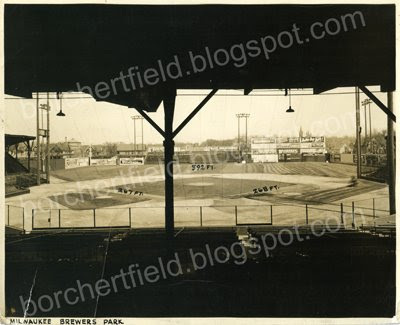 Unlike the Polo Grounds, the outfield corners were devoid of seating - the bleachers were limited to one small section in center field, and anything hit with a little power down either baseline would land in the middle of a street. 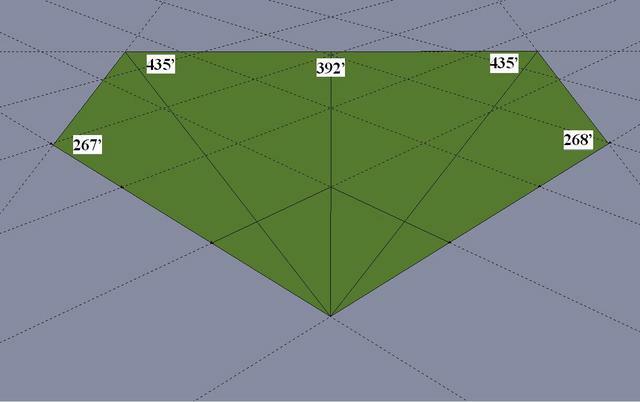 It lists the dimensions as 267 feet down the left field line, 268 down the right field line and 392 feet to straight away center. 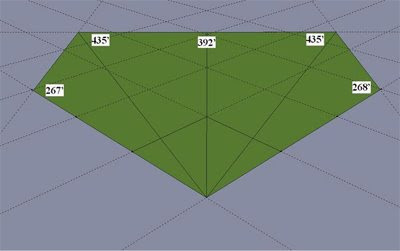 He calculated a distance of 435 feet to each of the corners, "with only a couple of inches difference between the two". That's an awful lot of real estate for an outfielder to cover. There have been many legends to don the flannel of Milwaukee. 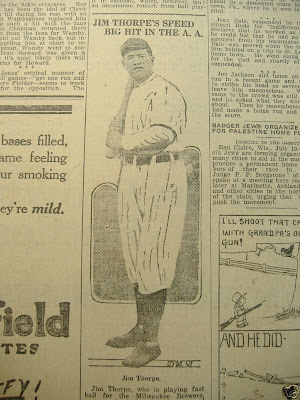 Although not remembered as such today, among them was the storied hero (and later goat) of the 1912 Olympic Games, Jim Thorpe. Thorpe, a multi-sport athlete dubbed "the greatest athlete in the world" by King Gustav V of Sweden as he presented Thorpe with a gold medal, dominated football, baseball and track and field. He would be stripped of his Olympic records and medals when it was discovered that he had previously played some professional baseball, forever losing his amateur status. It was common for college athletes to play pro ball at that time, but unlike Thorpe, most competed under pseudonyms (as did Pro Football Hall of Famer John McNally when he took the field for the Green Bay Packers as "Johnny Blood"). After the Olympic controversy, Thorpe returned to baseball, sporadically playing for the New York Giants from 1913 through 1915. 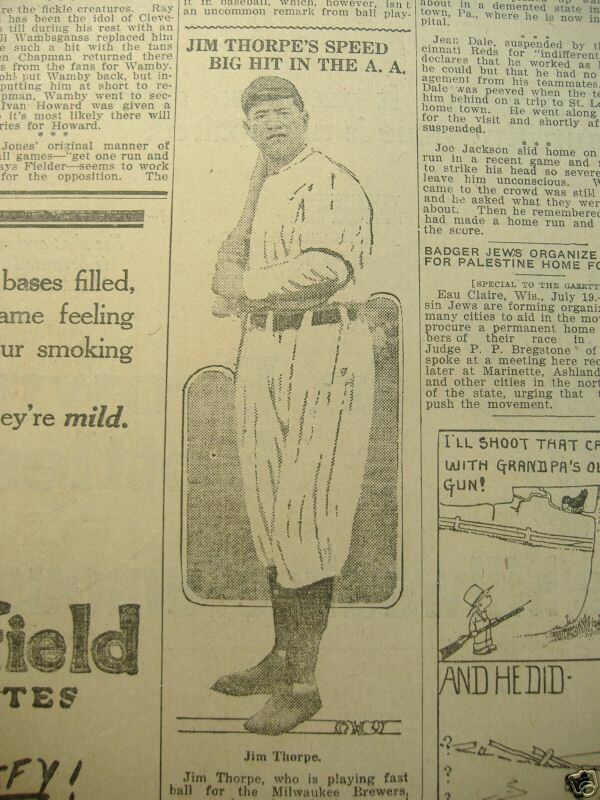 He spent the 1916 season in Milwaukee, the only good player on a terrible, terrible club. 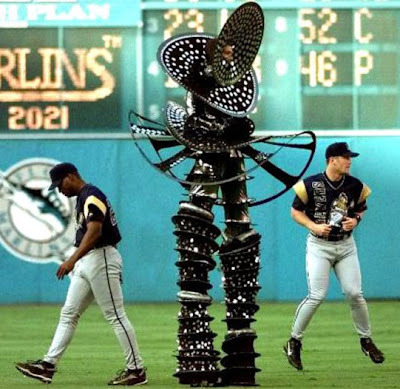 The Brewers lost 100 games that season (the first Milwaukee club in any league to do so), finishing dead last, 18½ games out of seventh place. 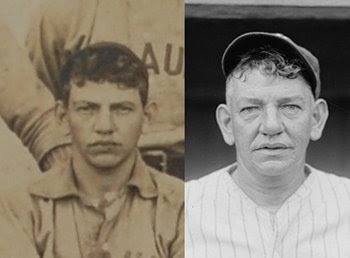 After returning to the majors with the Giants in 1917, he would indeed be sold to Cincinnati early in the season (he would go back to New York later in the year). 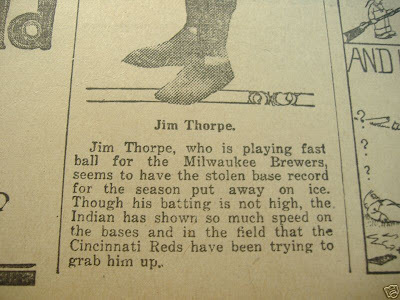 Thorpe played organized baseball until 1922, all the while playing professional football for the Canton Bulldogs in the off-season (the Green Bay Press-Gazette selected him to the first official All-NFL team in 1923). Today, he is remembered mostly for the Olympic scandal and for his namesake town in Pennsylvania, which he had never visited. 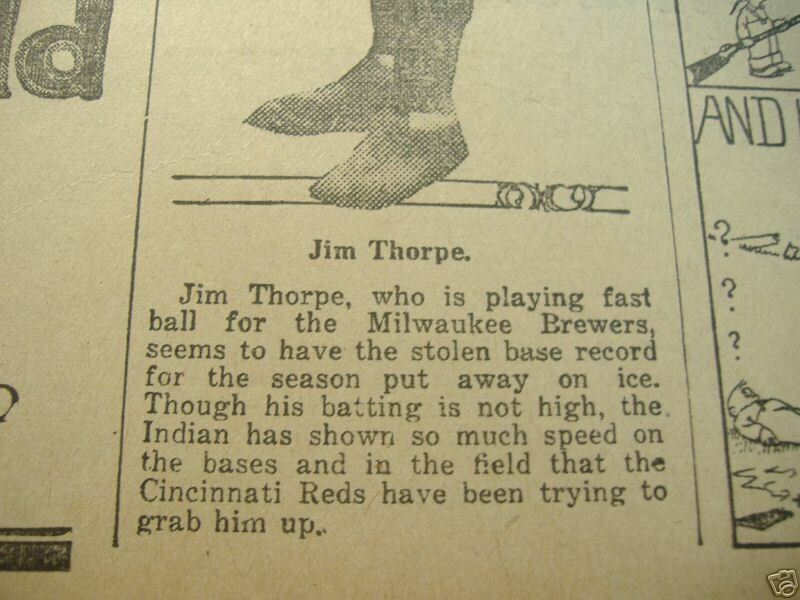 But Jim Thorpe deserves to also be remembered for his contribution, if only a brief one, to the legacy of the Milwaukee Brewers. 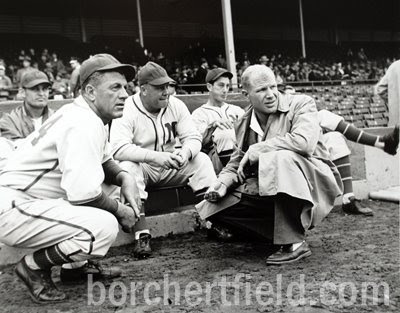 Originally known as Athletic Park, and known for the first few decades of the 20th Century as Brewer Park, it was renamed for team owner Otto Borchert following his death in 1927. 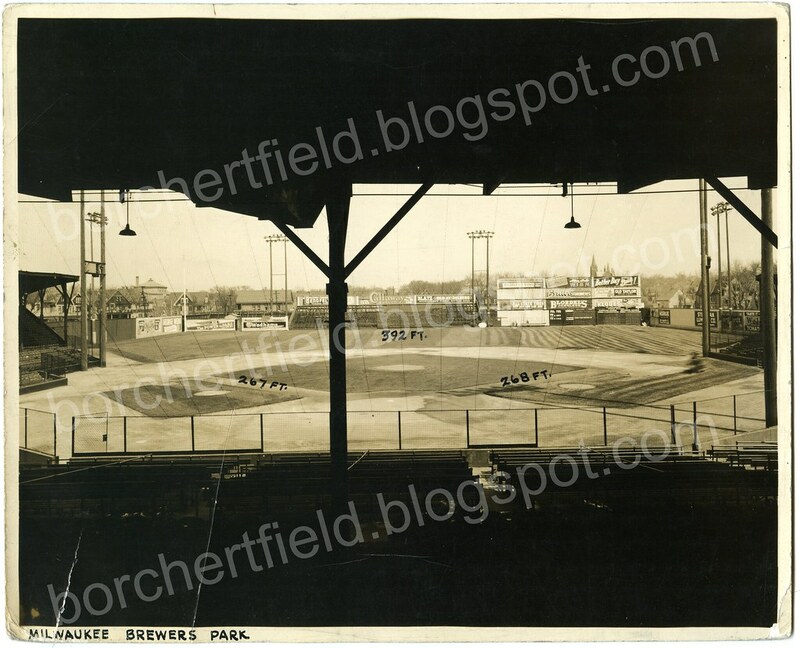 Sportswriters referred to it as "Borchert's Orchard" and simply "The Orchard." 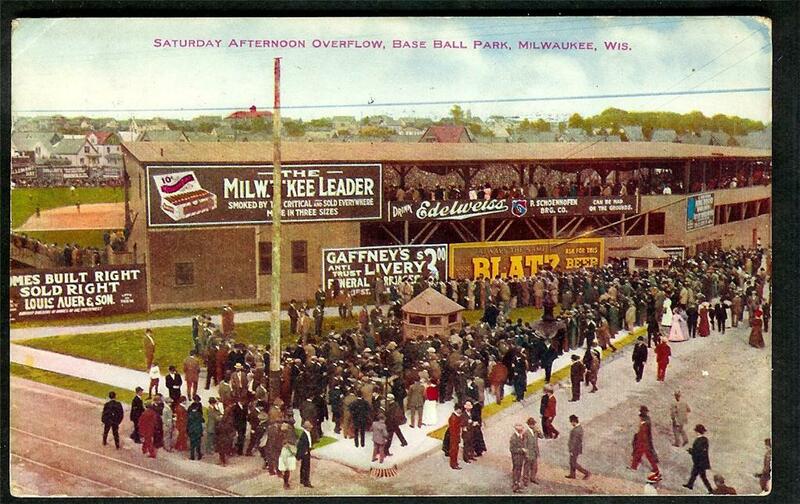 The original tenants were the Milwaukee Creams of the Western League. 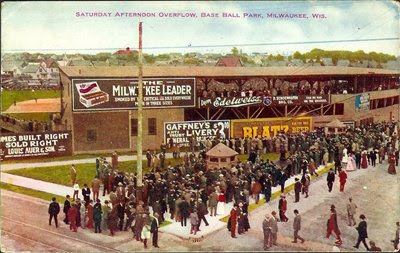 The Milwaukee franchise in the Western League would eventually be known as the Brewers, but by the time the Western League renamed itself the American League and declared itself the second major league, the Brewers had left Athletic Park for another Milwaukee baseball field, the Lloyd Street Grounds (on Lloyd Street, naturally, taking up the two blocks between North 16th and 18th Streets south of North Avenue). 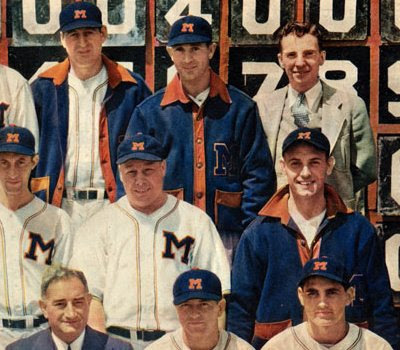 The American League Brewers would play only one season before moving to St. Louis, where they set the standard for futility as the Browns. 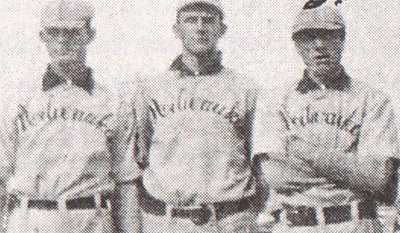 Filling the void was a new club in the minor league American Association, adopting the now-traditional Milwaukee Brewers name. They moved into Athletic Park and built a colorful 50-year tradition, a success which would ironically would pave the way for the return of the majors. It was not to be. 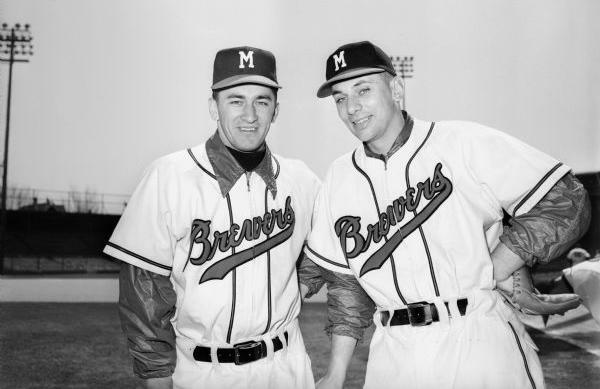 Just days before the start of the regular season, the Braves got permission from the National League to finally move to Milwaukee. The Brewers would never have a chance to play ball in their new park, moving instead to Toledo to replace the recently-departed Mud Hens, and a proud chapter in Milwaukee baseball history would come to a close. 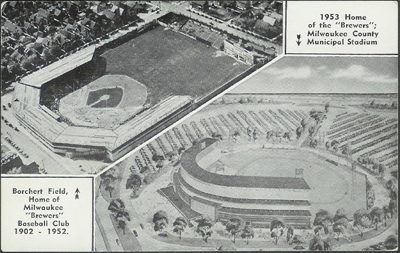 The neighborhood is still known, as the map indicates, by the ballpark's name. An historical marker was unveiled in August 2008 in Clinton Rose Park, a few blocks east of where the Orchard once stood. 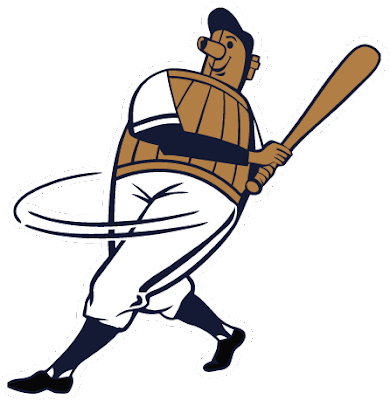 In 1946, the Brewers were purchased by the Boston Braves, ending their run as an independent club (with the exception of two seasons, 1934 and 1935, in which they were owned by the St. Louis Browns). 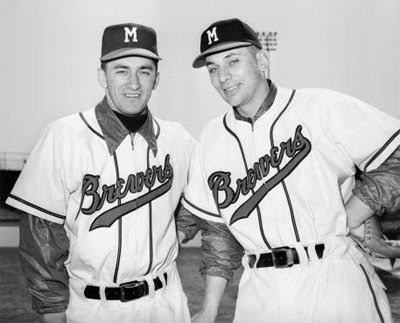 The Braves' influence on Milwaukee baseball was tremendous (and well-covered elsewhere) but the influence would be expressed in a particularly subtle fashion - on the uniforms. 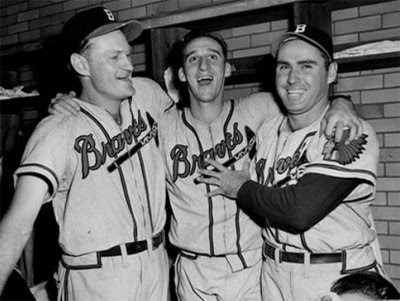 The Brewers had worn blue and red for decades, but during the period in which the Braves owned the club their uniforms would come to resemble the parent club's look more and more. 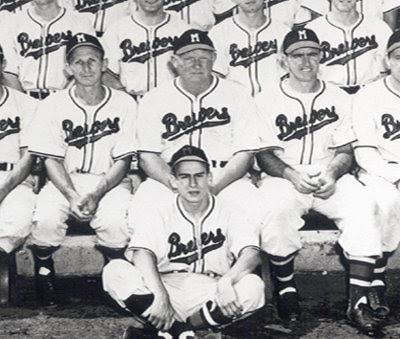 Note the old cap on the batboy, front and center. 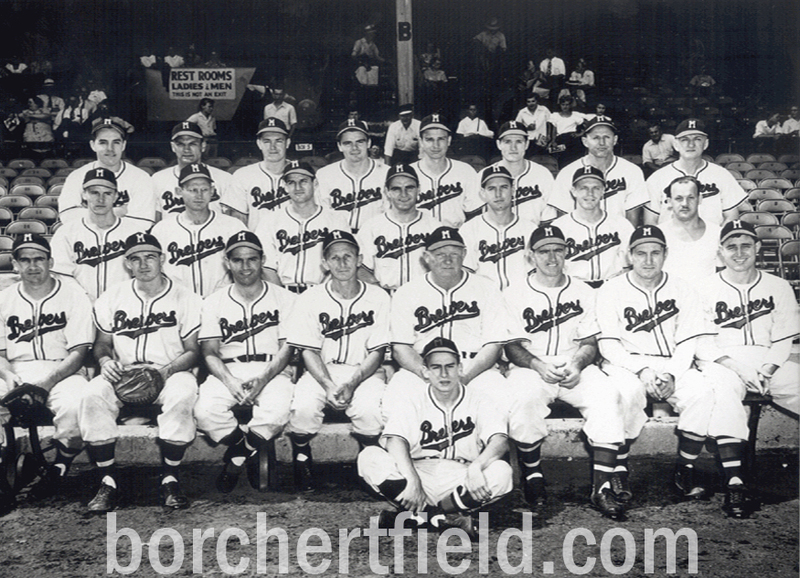 Other than the actual team name itself, the only differences between these uniforms and those of the Boston Braves are the lack of tomahawk under the team name (replaced by a tail) and the lack of piping on the belt loops. 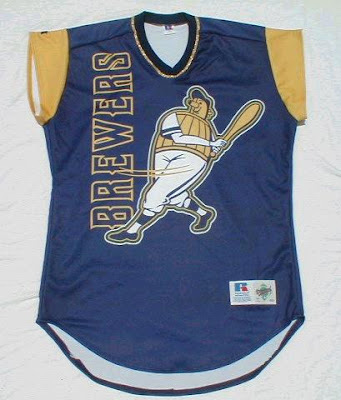 That one is particularly interesting to me, as it was customary to send old major league uniforms as "hand-me-downs" to the minor league clubs. The Brewers had uniforms which were nearly identical to those of the Braves, but just different enough so they couldn't advantage of the cost-saving measure of recycling the big club's uniforms. Come on, Mr. Attanasio. It's time. 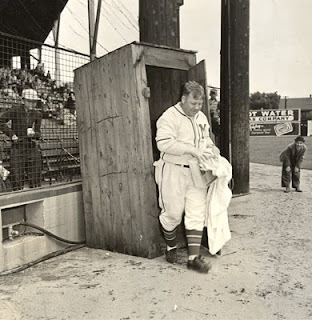 The Beer Barrel Man (known in his original incarnation as "Owgust") has been a symbol of Milwaukee baseball for decades. 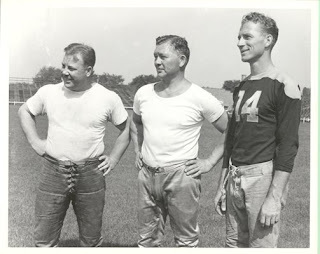 But aside from a brief spell on team jackets in the 1940s, he never made the uniforms. Until 1999. Ironically, it would come on an occasion when the team was looking to the future, not the past. 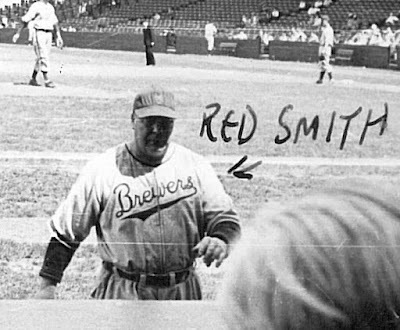 This is the first instance of which I'm aware that the Beer Barrel Man had graced a Milwaukee uniform (he did make an appearance on the team's jackets in the 1940s). While the Jetsons jersey template isn't anything to applaud, it was great to see the BBM back again. 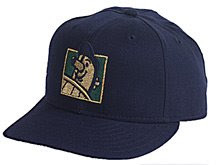 I bought one of those caps at County Stadium back in the day, wish I could find another.